The ETC ColorSource Spot brings together the afford-ability of a four-color light engine with the build-quality and support of an ETC product. Using a unique mix of red, green, blue and lime LED emitters, the ColorSource spot allows for an amazing range of color and depth, unlike other low-cost LED fixtures. Because it utilizes standard ETC optics, adapters and accessories, it is a versatile solution for any lighting need. ColorSource Spot fixtures are now available in two versions: original and Deep Blue, using a array that offers richer, more saturated blues and strong magentas in exchange for the more jewel-toned blues like sky or turquoise available in original ColorSource Fixtures. 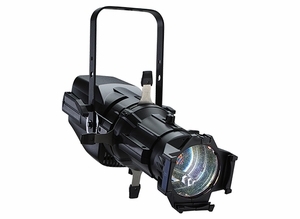 ColorSource Spot luminaires ship with barrel, a soft-focus diffuser in a gobo holder, a 1.5m PowerCON power-input cable with a connector of choice and a C-Clamp. Does Not Include Lens Tube. ColorSource RGB-L array (Red, Green, Blue and Lime). • New, ColorSource Deep Blue models! • The ColorSource Spot is compatible with Source Four lens tubes, Source Four LED Fresnel Adapter, and the Source Four LED Cyc Adapter.